Greenpeace is a leftist environmentalist group that seeks to ban commercial whaling and stop nuclear testing (see nuclear test ban treaty). Greenpeace activists building an Ark. Environmental groups like Greenpeace have boasted that they have blocked more than 200 hydroelectric projects in the developing world over the past two decades. According to Public Interest Watch (PIW), Greenpeace Fund, Inc. a reputedly educational, public-interest-oriented 501(c)(3) directed $24 million in tax-exempt contributions into Greenpeace, Inc., non-exempt programs during tax years 1998, 1999 and 2000. According to the most recent tax returns available for both groups, in 1999, Greenpeace, Inc.'s total revenues equaled $14.2 million. Of this amount, $4.25 million, or 30%, came from the Greenpeace Fund. Greenpeace Inc. is a more directly political and leftist activist unit, and as such is designated by the Internal Revenue Code as a 501 (c)(4). Mike Hardiman of PIW said "Greenpeace has devised a system for diverting tax-exempt funds and using them for non-exempt — and oftentimes illegal — purposes...It's a form of money laundering, plain and simple." On January 30, 2003, some 30 Greenpeace demonstrators breached the central control building of the Sizewell B nuclear-power plant in Suffolk, England. Earlier in October 2002, approximately 150 Greenpeace protesters were arrested after penetrating the same facility. In October 2013 Greenpeace activists were sentenced in Russia for piracy. This fire and radioactive leakage reminds us yet again of the serious threats posed by nuclear power.... Nuclear power undermines the real solutions to climate change, by diverting resources away from the massive development of clean renewable energy sources the world urgently needs. This policy extends to opposing scientific research into nuclear fusion power. The Greenpeace website makes the untruthful claim that nuclear fusion would 'create a serious waste problem, would emit large amounts of radioactive material and could be used to produce materials for nuclear weapons'. 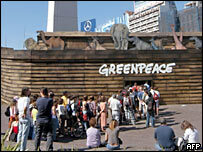 The U.S.-based organization Committee For A Constructive Tomorrow targeted Greenpeace ships in Copenhagen as propaganda. Activist and president David Rothbard says, “Greenpeace ships, like the Rainbow Warrior and Arctic Sunrise, have become global symbols for radical environmentalism, and we wanted to call attention to the harm these groups are causing. And second, it seemed appropriate to use one of Greenpeace’s favorite tactics to make this point.” CFACT unfurled a giant banner which said Propaganda Warrior and CFACT as the Greenpeace ship moved. On 10 July 1985 the Rainbow Warrior, flagship of Greenpeace, was destroyed in an Auckland harbour by high explosive devices that resulted in the death of Fernado Pereira, a crew member and photographer. An investigation into the bombing resulted in the arrest, trial and conviction of Major Alain Mafart and Captain Dominique Prieur of the French Armed Forces. After initial denials by the French President François Mitterrand, the French Prime Minister Laurent Fabius admitted that the French Secret Service ordered the attack in order to deny Greenpeace access to French territorial waters. Mafart and Prieur pleaded guilty to arson and manslaughter and were sentenced to ten years on the manslaughter charge and seven years on the arson charge. However, in an agreement between the French and New Zealand governments brokered by United Nations Secretary General, Mr Xavier Perez de Cuellar, the French government, while not apologizing, paid compensation to Greenpeace and the New Zealand government for this act of state-sponsored terrorism. In return Mafart and Prieur were transferred in July 1986 to Hao atoll in French Polynesia to serve three years. However, in December 1987 Mafart was returned to France for treatment of a stomach condition, and in March 1988 was given a new appointment. Prieur and her husband, who was in charge of security at Hao atoll, were returned to France in May 1988. ↑ Seeing Greenpeace, Deroy Murdock, National Review Online, October 07, 2003. This page was last modified on 9 April 2019, at 09:34. This page has been accessed 21,720 times.